Vicky: I love your project idea of a flower journal. I hope you share this every month so we can see how it progresses. 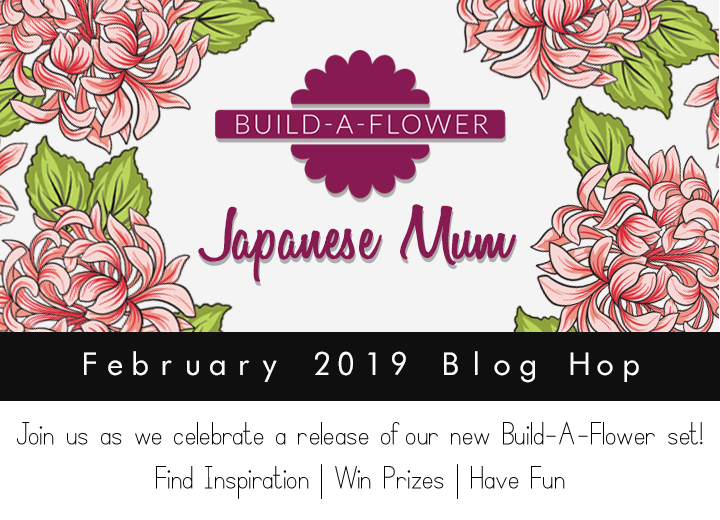 The mums you created are gorgeous and I love how you used washi tape to make your vase. I look forward to seeing your finished product. Your talent is amazing! I feel as if u tell a little story with each of your creations! Love and admire your work so much! And this stamp set is gorgeous!! You vase of flowers is truly gorgeous Vicky! 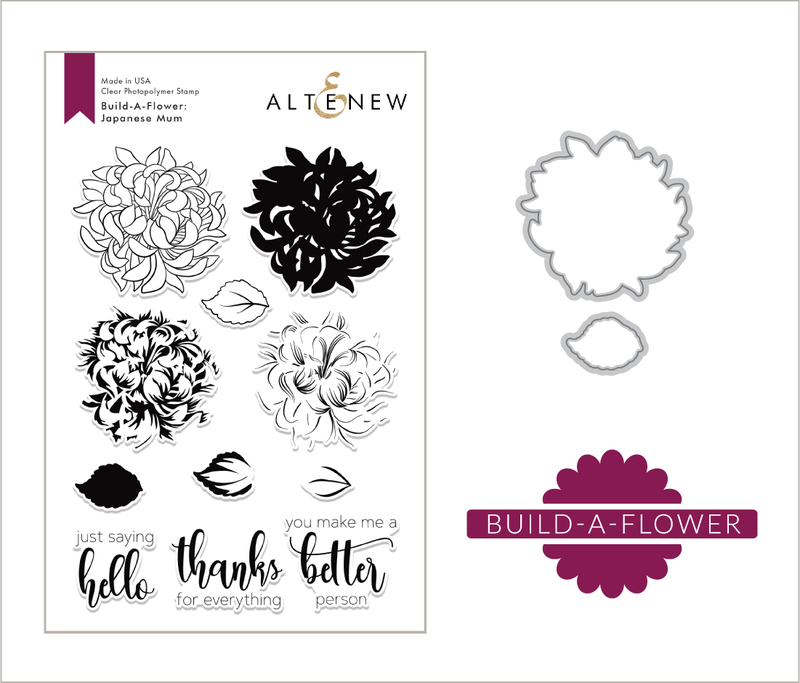 It certainly showcases those amazing new Altnew flowers! Thanks so much for all the helpful hints as well as the great inspiration! Vicky, you created a gorgeous journal page! I love how it all came together. Would love to see your journal when you are finished with it. Vicky, I love your work! Wether it’s a card or your art journals, they are all beautiful and so unique. your mums are beautifull, and your vase, washi tape, great idea! I can’t wait for the next flower addition to your journal! So pretty! Vase is so unique. Such a beautiful page! Love the idea of a flower journal. 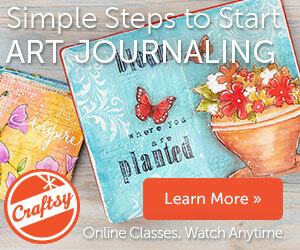 I am so excited about your new floral art journal, looking forward to seeing you create every page! Beautiful!!! I love your video’s. I like the idea of leaving off the outline stamp. which gives a different look. You have so many great ideas. and they will work in card making. 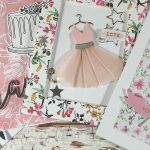 Your video’s are very inspiring for me and my card making. I loved your video Vicky and I think you art journal is amazing, it is such a fantastic idea, you are so creative! The two pages you have created so far are beautiful, they really are pieces of art! I’d love to do something like that but I wouldn’t know where to begin. Do you ever teach classes on how to do this? I can’t wait to see your next page!!! WOW…another beautiful creation! You make me want to buy every stamp set out there! 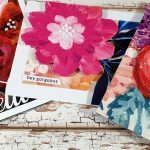 I love your art journaling projects as well as your cards; Thank you so much for sharing your ideas! I love how you used the washi tape for the vase. Very creative! Thanks for sharing! lovely journal cover, Vicky – the washi tape for the vase is perfect with those beautiful flowers! Beautiful cover. These flowers are wonderful. I love this page that you added to your flower book! Beautiful! This is such a beautiful stamp set! Thanks for the inspiration! 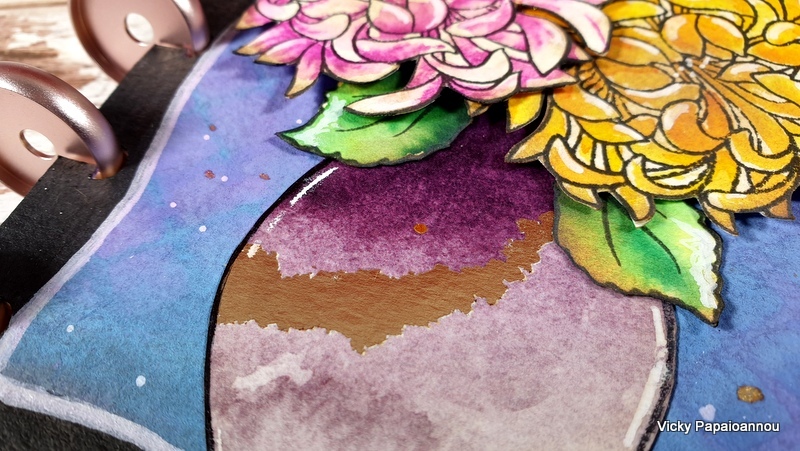 This is such a beautiful bloom and I love the way you used the water colour brushes with this set. Vicky, your art journal pages are always so inspiring and this one is no different, I have no doubt in my mind that you with use all of the letters by the years end! So very pretty! Love how you used it! I love your use of the Washi tape. The Japanese Blossoms are so beautiful! They are colored wonderfully!! What a fabulous BAF!! What a great, fun project! Your pages are beautiful. I hope you share the whole book when you’re finished. I love the idea of the washi vase. It looks fabulous. Love the colors on the flowers. They really pop. The vase you created is pure genius. One more Altenew set I need to get! Such a pretty flower, I love the colors that you used. Thank you for sharing. That’s a lovely idea for a journal. It’s a beautiful page. This is beautiful! I love the gold letter J and of course the colors of the mums! Great design! Awesome, I love the new stamps! I’m very much enjoying this year in flowers series. It gives me lots of interesting ideas for cards, even though you’re doing it in art journal form. Thanks for sharing with us! Love the dimension on here as well as the colors! Lovely as always. LOVE your idea for the vase. Just perfect! 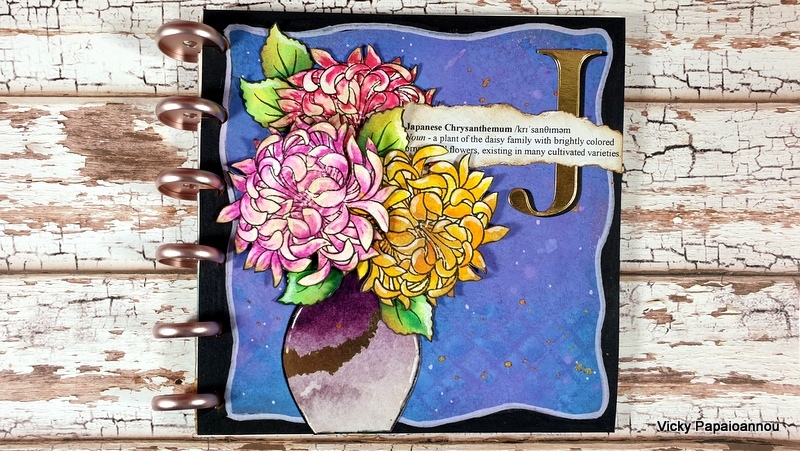 I love your art journals and the idea of a special one just for flowers is wonderful. Can’t wait to see your next flower page. Beautiful Journal Page! What a great idea. I love the vase too (I wouldn’t mind having one of those in my house). Thanks for the inspiration! Beautiful. 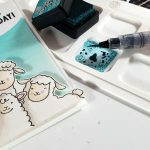 This looks like a fun thing to do with other stamp themes also. I was thinking Mermaids. Absolutely gorgeous colors. I love this Japanese Mum. I plan to start an art journal soon and this is a wonderful inspiration. Loved your color combinations and your idea for an A-Z flower journal is inspired. Inspirational! What a wonderful way to teach youngsters their botany and alphabet at the same time! Wonderful journal cover! I love how you used the washi tape and these big, beautiful blooms are a fabulous way to decorate! Thanks so much for sharing! Your journal is looking great so far, hope you are able to make an entry for each letter of the alphabet. 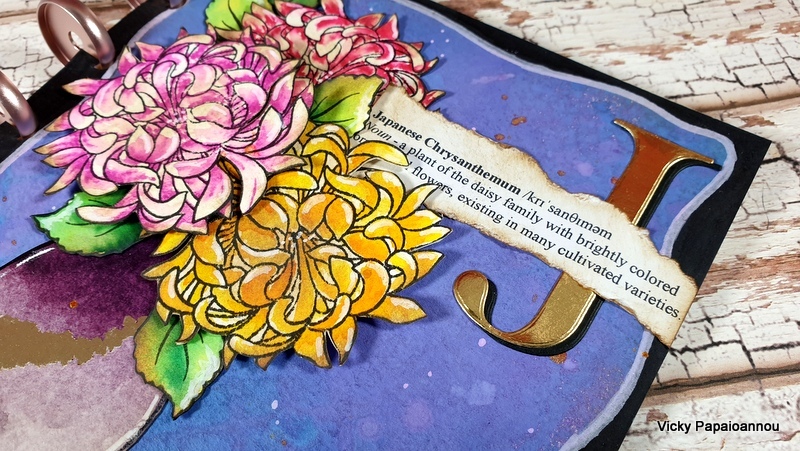 Such interesting techniques you shared for using the layering stamps in different ways, thank you. I love the journal theme. 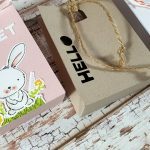 Lovely all the way around and using the washi tape was a wonderful touch! Very colorful and Beautiful creative work of art! 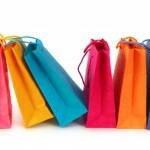 Love your designs…So Cheerful and Inspiring! Great Work! Well Done! Gorgeous! 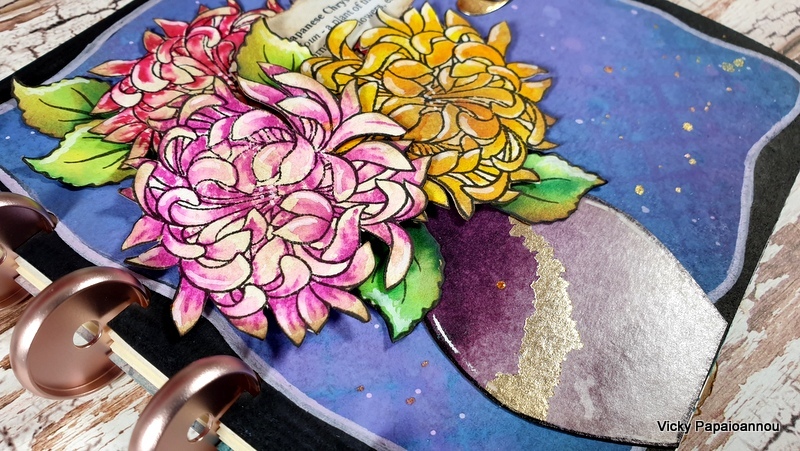 These mums make such a fabulous art journal page. Vicky, such a beautiful project! This flower set has to be my favorite to date! So lovely. I love your coloring. I can’t fussy cut at all so I really admire your talent for that as well. TFS!